This paper summarizes the key features of a systematic framework for assessing the aggregate employment impacts of a portfolio of development cooperation interventions. 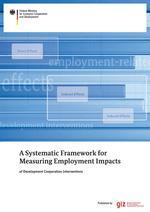 The methodological approach follows a bottom-up procedure based on three steps: (i) estimating employment effects at the intervention level, net of the counterfactual scenario; (ii) estimating (economy-wide) employment impacts of interventions taking into account employment-related indirect effects of the intervention such as displacement, substitution and multipliers; (iii) aggregating these employment impacts across the portfolio and deriving comparable parameter values for employment effects. This article is part of the RE-ACTIVATE project. RE-ACTIVATE “Promoting Employment through Renewable Energy and Energy Efficiency in the MENA Region” is implemented by the Deutsche Gesellschaft für Internationale Zusammenarbeit (GIZ) GmbH on behalf of the German Ministry for Economic Cooperation and Development (BMZ). This page was last modified on 15 October 2018, at 12:24.